Spearheading the Maurice Lacroix Manufacture, the Masterpiece collection strikes a clever balance between technology, tradition and modernist esthetics. It represents the brand’s expertise and, in particular, its mastery of retrograde complications, moon phases and chronographs, while creating a new image for the measurement of time. The timepieces of this flagship collection meet the highest standards of mechanical watchmaking set out by renowned Manufactures. The cases, dials and movements attest to the quality of their design and execution down to the minutest detail, which in turn reflects the brand’s rigorous approach to research and development. The esthetics of the Masterpiece collection have evolved toward a contemporary design inspired by the art of living. Featuring modern finishes and silhouettes, this collection promotes a new experience of watchmaking that is firmly attuned to today’s world. Combining expertise and daring style, these watches revisit tradition with simple elegance, avoiding pretence and excess extravagance. Created for modern-day dandies for whom performance and etiquette are everyday necessities, these watches embody the identity of a young brand whose innovative edge has given rise to a solid reputation. This year, two new timepieces have joined the world of mechanical jewelry. Driven by movements designed and developed in-house, the Masterpiece Chronographe Squelette and the Masterpiece Lune Retrograde capture time within a prominent high-tech case. Water-resistant to 100 meters, they boast shaped push-pieces and a ¼-turn screw-down crown. The decoration features alternating polished and circular/vertical satin-brushed surfaces, which result in a perfectly finished and balanced design. Refined. Striking. Powerful designs and precise operation firmly entrench these watches in an urban and hedonistic 21st century, which enjoys combining time with sophistication. An avant-garde design housed within a diameter of 45 mm. A skeleton that shapes time. 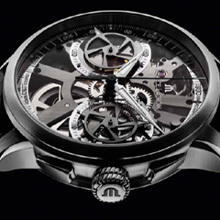 A Manufacture –made mechanism, the ML 106-7 caliber. This new instrument for the measurement of short time intervals deserves the utmost respect. Its precise mechanics, for which a patent has been filed, and openwork design, which displays and thus authenticates the movement, are the cornerstones of an undeniably contemporary collection. 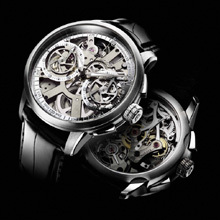 Offering a new take on the skeleton watch, which had already been fully redesigned in 2007 with the Masterpiece Squelette, this model looks like being a worthy successor. Protected by a sapphire crystal with an anti-reflective coating on both sides, the manually wound movement is proudly on display. Within this maze, the workings of the skeletal structure enjoy a refined, streamlined effect and have been reduced to the bare essentials. Hypnotized by the movement’s intricacy, the light brushes past the dusky seconds hand, before bouncing off the sharp, luminous spurs of the hours and minutes hands. Having pierced through the slate-gray metallic sapphire dial, with its applied time indicators, it comes to rest on the chronograph counters, intrigued by the presence of a 60-minute counter. It then follows the movement of the counter’s hands which, shaped like skeletal discs, resemble the gears of the movement. It then ricochets off the snailed architecture and black screws of the bottom plate, before being drawn into the depths of this compelling time machine. Once inside, it tames the escapement, grazes across the golden gears, acquaints itself with the column wheel and caresses the rubies. Then, in a flash, it slips through the sapphire-crystal case-back, powered by the oscillations of a well-concealed, black balance that blends into its surroundings until almost invisible. Movement: Chronograph equipped with a Maurice Lacroix Manufacture movement and its own lever assortment, gear-train and spring balance. Developed, manufactured and assembled in-house. Precision enhanced by innovation/Patent: 60-minute counter: a rare function that is highly adapted to accurate time-keeping a more precise chronograph function (accurate to 1/5 second) is maintained in direct relation with the seconds hand for optimal precision. Maurice Lacroix patent on the lever (located under the hammer). In the event of impact, this technical innovation optimizes security during the interlocking or releasing phases, thus guaranteeing utmost precision. Chronograph-wheel enables a special toothed shape (300 teeth) to be used, which cannot be crafted using traditional fabrication techniques. It is another guarantee of utmost precision. Decoration: Hand-decorated bridges plated with black gold and featuring a large snail-like pattern ML wheel design matches the design of the hands and discs. Case: Combination of polished sunray, circular- and vertical-brushed surfaces, steel case, 45 mm diameter, screwed steel bezel, domed sapphire crystal with anti-reflective coating on both sides, Integrated shaped push-pieces, screw-down crown in ¼ turn, screwed case-back featuring large sapphire crystal with anti-reflective coating, water-resistant to 100 m / 10 atm. Dial: Sapphire-crystal dial with metal-coated treatment, dial with anti-reflective coating on both sides for a clearer view of the skeleton movement, slate-gray metal-coated treatment to reinforce the effect of the double counters and chronograph-seconds track function, white SLN (SuperLumiNova) spots on counters and second tracks. Strap: Black hand-stitched porous crocodile-skin strap with large scales, black calfskin lining and matching stitching.